Preschoolers learn to audiate music as they develop through the music learning stages of Acculturation, Imitation, and Assimilation much the same as they learn language. Click Here for a FREE preview of 25 pp. 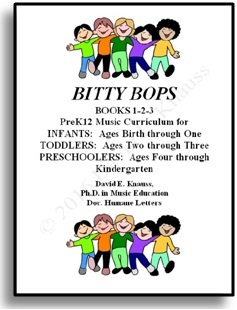 from Bitty Bops PreK12 Books 1-2-3. Note: You will need Adobe Reader to view and print the excerpt.